The last little while I’ve been hard at work making a push to wrap up the last of the maps for the moth field guide. This is partly because I’ve been itching for spring and the return of moths and wanted to focus on something moth-y, but mostly so that we will still have lots of time to review them before our deadline this summer. It’s been a bit of an undertaking – we plan to cover some 1300 species in the guide, and hope that some 800 of those will have range maps accompanying them. This will be the first guide to comprehensively provide maps for the majority of macro-moths, for the entire northeast region. Guides that have gone before have simply offered text descriptions of range, but these can be so hard to interpret, especially when you’re not one of the corner states/provinces given in the text. We wanted to include something that would be faster and easier to interpret than text, more “user-friendly”. 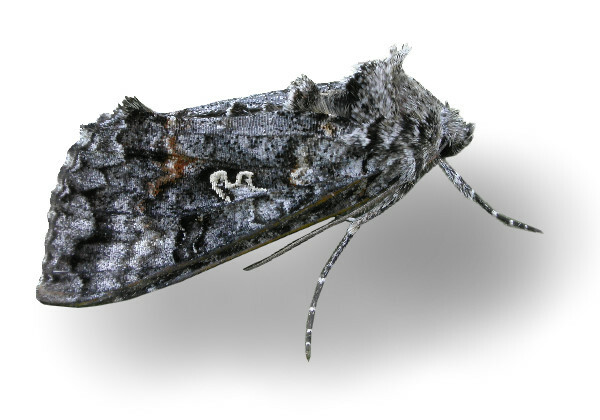 The downside to this decision is that there just isn’t the data out there for moths that there is for other organisms, such as trees or birds. The data that does exist is in a highly scattered form. It includes records that may be extralimital occurrences (ie., vagrants), but with so few data points it’s hard to know for certain which ones are and which ones aren’t. I have a number of resources I’m referencing, both printed and web, as well as checklists and collection data from private moth’ers. I wish I had the sort of information at my disposal that birders have, but I’m making do. There are a couple of approaches to presenting the data on a map. We could just plot points for locations we had data for. While this is easy to do and is guaranteed not to lie, it also doesn’t tell the whole truth as the species may occur in other areas where it just didn’t happen to be collected. We toyed with filling in states and provinces in a presence/absence presentation based on the data we had, but once again, while it was easy to do, this approach would also be misleading – even if a species only entered a state along one side or corner, it would still be displayed as though it occurred throughout. We really wanted to do smoothed range maps, because they look the nicest, but they require that you have a strong body of data in order to accurately define the boundaries. After considerable thought and discussion, we decided to combine the latter two approaches. However, rather than using political boundaries to define our areas, we took an ecological approach. The map above shows ecoregional boundaries as defined by the North American Atlas project, a partnership between the Commission for Environmental Cooperation, and the governments of all three North American countries (you can download their maps for free here). The data I had for each species of moth was matched to the ecoregions on the map, and a range drawn encompassing all ecoregions that the species was known or believed to occur in based on collection data as well as information on habitat or food plants. Some assumptions are necessarily made in mapping ranges this way, and the depicted ranges may over- or under-estimate occurrence, but in a group of organisms for which data is sparse, this is almost inevitable. 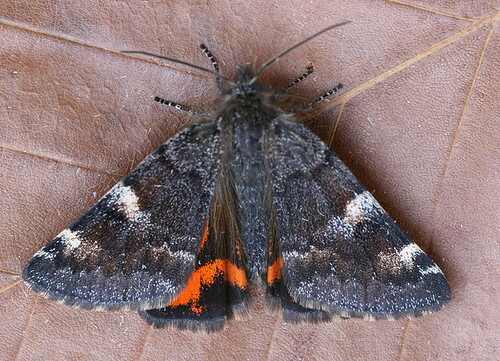 One of the hopes we have with the publication of this guide is that there will be an increase in interest in moths as a result of an easy-to-use ID guide, which will in turn create a bigger database of observations as people go out to look. Hopefully the second edition, down the road, would be able to refine the maps. In the meantime, I’m happy with how they’re turning out. Here are a few for a bunch of species that I’ve mentioned in the past here on the blog. I’ve also included the text range description from the original Peterson guide to moths by Charles V Covell, so you can see how they compare. The moth images below are the ones that accompanied the post, not the ones that will be in the guide. These are early spring fliers, sometimes out even before the snow has completely melted from the ground. I typically see them in open areas near patches of birch. I wrote about them last spring, in a post I did about birch trees. Text range description: N.S. 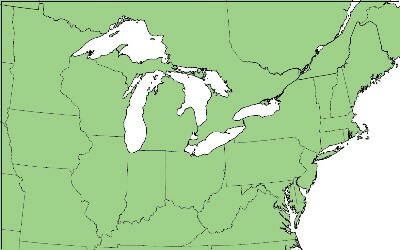 to N.J. and Pa., west through Canada south to Minn. This was my very first moth last spring. They’re encountered late in the fall and early in the spring, and occasionally in mid-winter on very warm days/evenings. They overwinter as adults, so they’re able to emerge from hiding to fly as soon as temperatures are warm enough. I’ve posted about tent caterpillars on a few occasions, but the first was on encountering a number of tents early in the spring during my first year of writing this blog. The adults fly in late June and July, after the caterpillars from the tents have pupated. 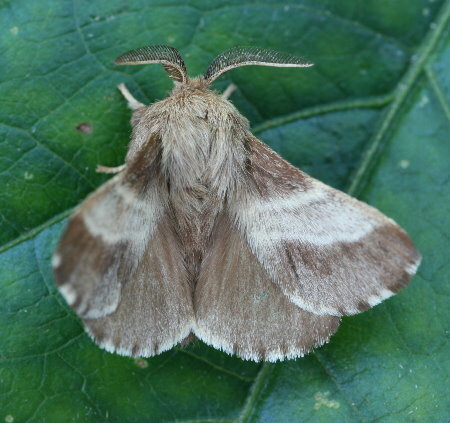 Back in September I participated in National Moth Night, a UK initiative that I was encouraging North Americans (and other countries) to adopt, too. Our two nights were cold here, and I got very little to my lights. 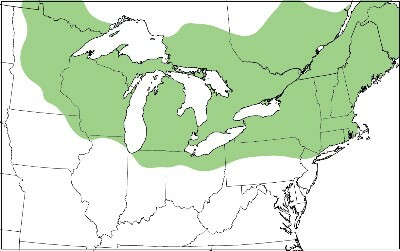 The species that turned up in highest numbers was Maple Spanworm. 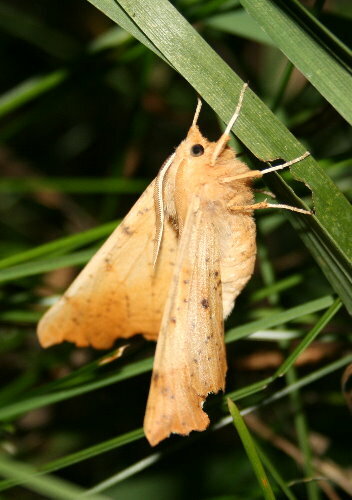 Incidentally, National Moth Night 2010 will take place on May 15. The date gets moved from year to year to sample different seasons. Don’t worry, I’ll remind you again before then. 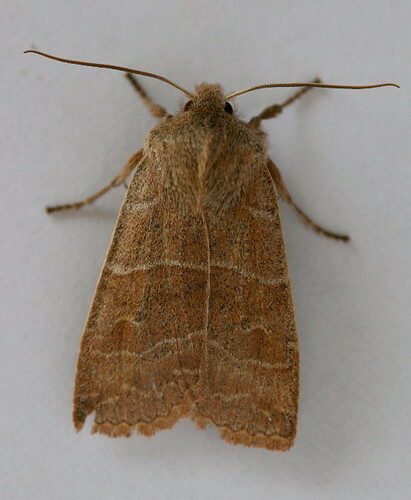 This entry was posted in moths and tagged field guide, range maps. Bookmark the permalink.